Over the last 10 years we have increasingly being involved in architecture and we have established amongst our clients a reputation for sound, practical designs and a reliable and responsive service. We offer our clients the added benefit and cost effectiveness of having the entire site designed and engineered by the same team. Including site investigation, structural and foundation design, architecture as well as access roads and drainage plans. Our ability to combine a practical engineering approach and elegant designing enables us to specialise in designing buildings that meet client budgets and requirements where often other designs have failed. We design practical but elegant buildings that take into consideration the best utilisation of use and space a client needs within the assigned budget. Our recent projects have involved industrial buildings, business parks and private homes. This old public house needed a complete redesign in order to attain an additional 12 bedroom hotel as part of the pub. 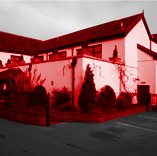 TM Ventham Practice demolished the entire building apart from the front elevation and redesigned the accommodation, hotel reception, restaurant and function rooms as well as retaining the public bar area. This was all achieved on the same site that the previous pub occupied. TM Ventham Practice is currently working on the designs for a modern private house on a steep hillside in Clifton. The house is in a conservation area in a prominent position overlooking the harbour. It presented a challenging exercise to provide a substantial modern home and underground parking whilst maintaining the aesthetic standards for this location.